A Formal Affair at Arts Fund – Celebrating 30 Years. September 29th, 2013 from 6 to 9pm. The Arts Fund celebrates 30th anniversary with A Formal Affaire: Art-Making in Black and White Exhibition, Auction, and Party in the Funk Zone. 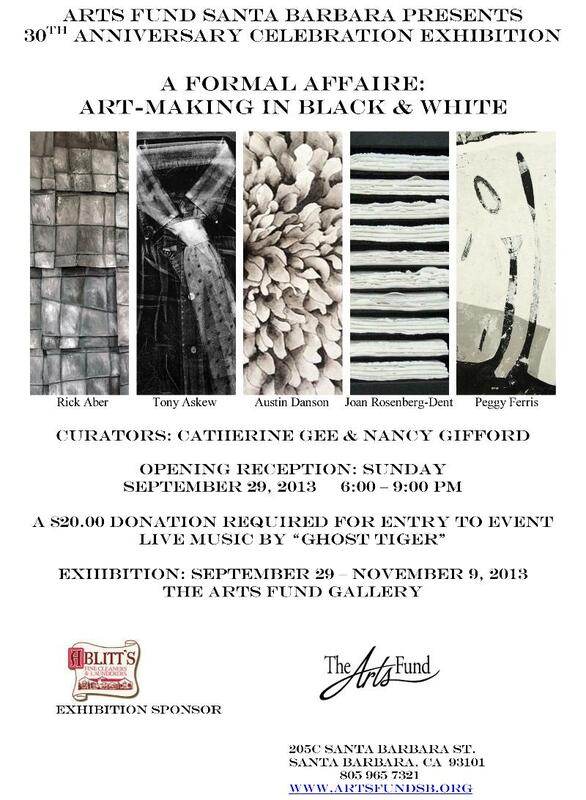 The Arts Fund is pleased to announce its 30th Anniversary celebration and exhibition: A Formal Affaire: Art-Making in Black and White. The opening and fundraiser will be held at The Arts Fund Gallery and in its adjoining parking lot located in the Funk Zone at 205C Santa Barbara Street on Saturday, September 29th from 6 to 9 pm. The celebration and exhibition will feature a gallery exhibition of art in black and white by Rick Aber, Tony Askew, Austin Danson, Joan Rosenberg-Dent and Peggy Ferris with a bountiful selection of arts-oriented silent auction and destination live auction items. Tickets are $20.00 and the price includes admission to the party, one drink (if you dress in the evening’s theme, black and white) and admission to hear live music from local band, Ghost Tiger. For more information and to purchase tickets visit www.artsfundsb.org. 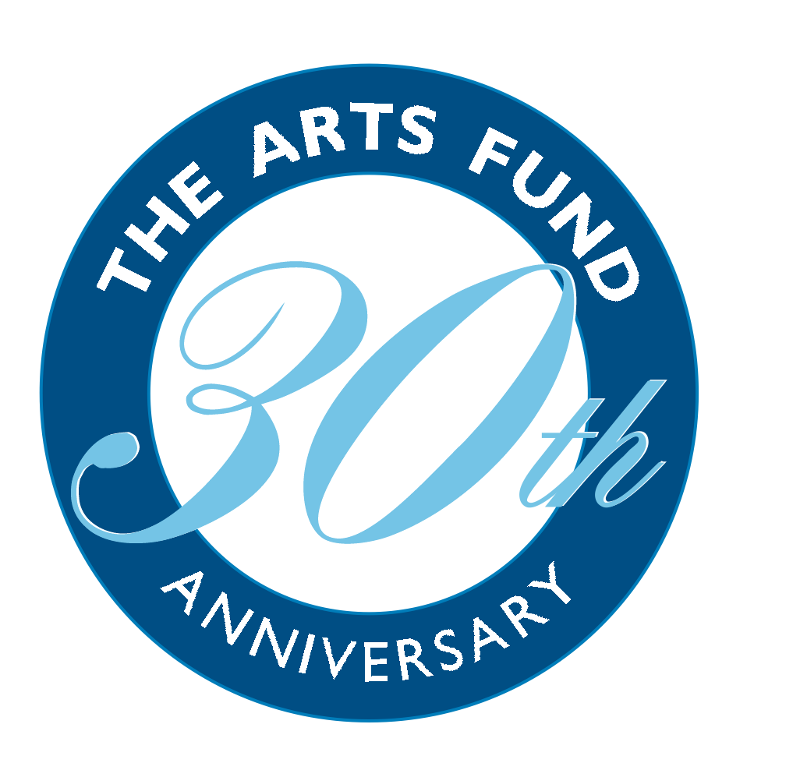 In tandem with the 30th Anniversary celebration, the Arts Fund is proud to announce the launch of its newly redesigned website at http://www.artsfundsb.org. The release of the new design and updated website is a precursor to the celebration of its 30th anniversary. For 30th Anniversary sponsorship opportunities, please contact the Arts Fund at info@artsfundsb.org or call 965-7321. Anonymous at Gold Level; Leatrice Luria, Chris Lancashire, Richard and Maryan Schall, Lynn and Roger Karlson, Shirley Dettmann, and Michael and Nancy Gifford at Silver Level; Gary Elkins and Jayne Brechwald, Joanne C. Holderman, Susan Bower, and Geoffrey and Polly Bloomingdale at Platinum Level; Paul and Annie de Bruyn Kops, Claudia Chapman, Oswald Da Ros, Rosalind Gies Amorteguy, Sonny and Carolyn Castagnola, Peter Stalker, Northern Trust, Marcia and John Cohen, Marcey Carsey and Susan Baerwald/Just Folk, Susan and Terry Northrop, and the Morris Squire Foundation at Patron Level. Exhibition sponsor is Ablitt’s Fine Cleaners, and Funk Zone event sponsors include Municipal Winemakers, Avelina Winery, Events Unlimited Organic Kitchen, Santa Barbara Winery, Deep Sea/Conway Family Wines, and Metropulos Fine Foods Merchant. The Arts Fund was established in 1983 dedicated to fostering the arts in Santa Barbara County. The organization’s formal mission is to create, fund and administer programs and projects that foster the arts for the people of Santa Barbara County, to act as a catalyst maximizing the effectiveness of arts resources, and to nurture collaborative relationships amongst arts organizations. The Arts Fund is known for the Teen Arts Mentorship program that matches promising high school students with professional master artists and writers in a workshop setting. In 2001, The Arts Fund opened The Arts Fund Gallery at 205C Santa Barbara Street at Yanonali in the Funk Zone. In the past year, the Arts Fund has spearheaded the Funk Zone collaborative art walk/openings with Michaelkate, Wall Space Gallery, Greenhouse Studios, Gone Gallery and other art studios and businesses in the Funk Zone.